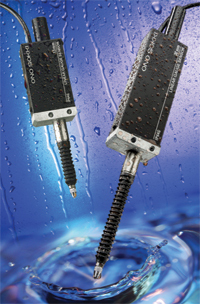 GS-1600 linear gauge sensor, a slim, compact gauge designed to measure dimensions, thickness, curvature, eccentricity, displacement, height, depth, flatness, run-out, roundness, distortion, deflection and position. It produces highly accurate measurements to 0.00004 in. throughout its full 30-mm measuring range. Its waterproof seal and dust bellow provide protection in harsh environments. Signal outputs are not only compatible with PCs, but with virtually all major SPC data-acquisition systems on the market.